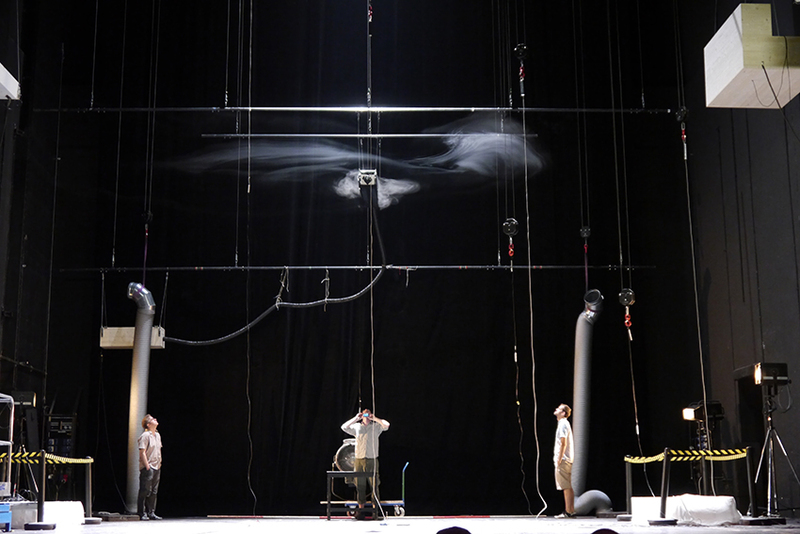 This essay is about the creation of a real cloud on a theater stage. It is about the challenge of meeting the design intent of both the artist and the engineer. It is about the process of trial and error, improvement, and critical dialog about what we achieved. 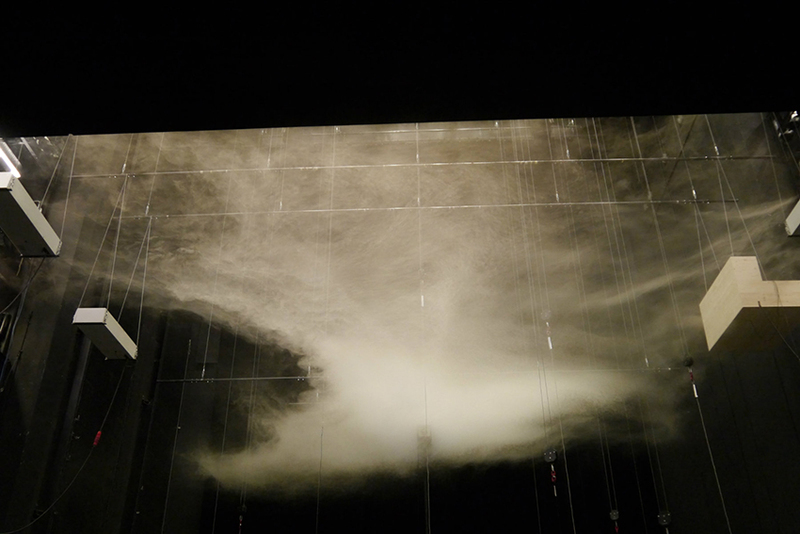 This cloud is part of the stage design of Danton’s Death, a Georg Büchner play directed by Johan Simons and performed at the Kammerspiele Munich from 2013 to 2015. The stage design was concieved by Eva Veronica Born, and the photographs were taken by Giovanna Kessling. Architects and engineers are joined in a permanent search for new ideas about form and function. 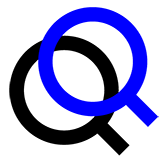 We integrate aspects of quality and cost, performance and energy. Do we get the fundamentals right? Do we think big enough? Do we manage complexity? Do we research relevant topics that will become game changers? Can we learn something from making a cloud? A cloud? Making a cloud is climate engineering at its best. It is about working with the physics of the environment and challenging a project’s constraints to do more with less. How can we work best with passive strategies to reduce active systems, without compromising aesthetics and quality? In the search for new solutions, process is key to success. Thinking outside the box of the discipline, and working within a broader system of shared values and apparent contradictions in artistic expression is achievable only through dialog. This essay reveals some of the steps we took to develop the theater cloud. As there is no obvious or complete set of criteria to judge good performance for a cloud, much of our dialog was about developing new criteria through trial and error. Even though we, as climate engineers, always work with measurements and technology in the background, the result has been predominately communicated visually. 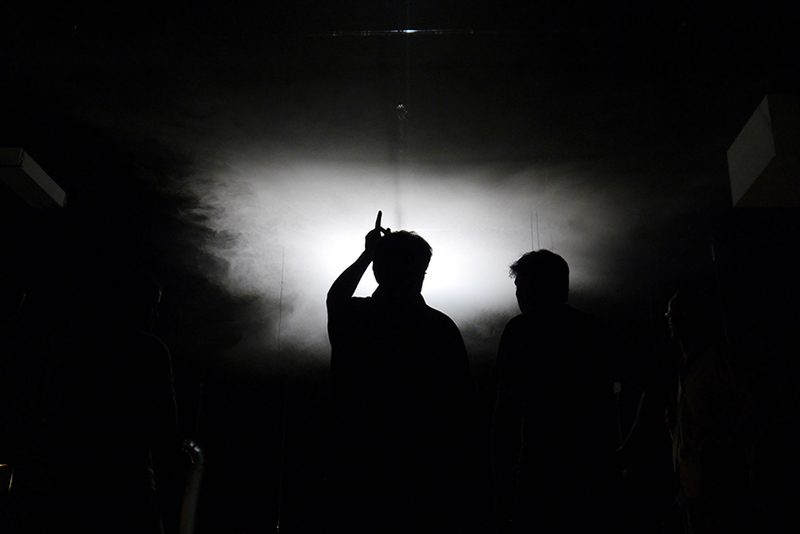 In team discussions, Born would describe the cloud pictured in her imagination: “After about one hour of the play, the cloud should start to appear in a very subtle way, ideally out of nowhere—hardly noticeable at the beginning. Very slowly the cloud should become more and more visible before developing into its full beauty. At the end, the cloud should be wild, reaching out to the audience before disappearing all at once.” Born wanted the cloud to be visible for a total of one hour. Initially, we were given a number of general performance criteria: to meet the aesthetic and artistic intent, we were to ensure that the cloud did not unduly interfere with the audience and actors, or compromise thermal comfort and air quality in the auditorium. We were to hide all required technology, be silent, and implement foolproof automatic cloud operation during the play. Above all, the cloud should not in any way look like common theater fog. Instead, it should be clearly separate from the stage and have a distinct and controlled shape. We had made indoor clouds before, so we knew that the task was about stratification—about creating very calm conditions with little to no air movement in the cloud layer. Stratification means establishing horizontal layers of cool and warm air. So we started off with the question: how to heat this theater? The first idea was to use the massive array of lights and lamps already in place to heat the stage tower. We thought the installation of some 200 kilowatt fixtures should do it. Yet nearby surfaces on the stage became too hot by the radiation before air temperature was anywhere near what was needed. We switched to air heaters, and achieved much better stratification. Unfortunately, though, the equipment was too noisy, and created too much air movement. Everything that we did looked messy. Clouds are extremely volatile objects. What you actually see when you look at a cloud, in an indoor environment, are particles that scatter the light to give it its shape. The particles mix with the air. They float. The denser the particle mixture is the better the visibility. Unfortunately for us, these particles move with every flow of air; they dilute and fade; they are hard to control. How could we turn fluid matter into a seemingly static object, one that would not interfere with the play happening just two meters below? Our ambition was to create a cloud that would be visible from every seat. This meant that the cloud needed to be positioned lower than the stage portal. Even the slightest temperature difference between the stage tower and the auditorium would produce air flows—pulling the lower end of the cloud from the stage and into the auditorium. How to control this flow, how to counteract it? The problem was a little bit like keeping a glass of water in place without the glass. 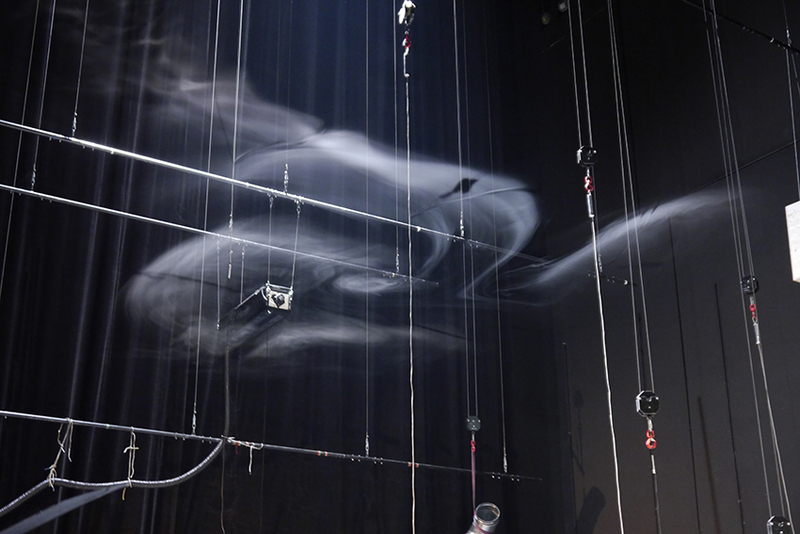 Even in undisturbed conditions, the air kept traveling between stage and auditorium at a speed of half a meter per second. We investigated many strategies to minimize this flow of air. One strategy was to use the existing mechanical fresh air system, and change the exhaust air path so that it would spill over through openings behind the stage. The idea was to create a permanently controlled, slow moving air carpet, which would support the cloud and keep it on stage. While technically this could have worked, it did not work for the stage designer or the play as this particular area of the back wall had been foreseen for video projection. We learned that a dedicated cool air supply on stage was absolutely necessary, in addition to a hot air supply above the cloud, to stabilize the stratification. Activating the raised floor, which was already a part of the stage design, as supply air plenum could create a cool air layer for the cloud to sit on. A lot of natural, but detrimental air movement occurred on the stage. As with all poorly insulated exterior walls, there was always draft, particularly during the winter. We had to use heavy soffits to separate the downdraft from the cloud. Air movement also increased as the building heated up by stage lights, actors’s movements, and the thermal load created by the audience. Even candles lit on stage created visible air movement in the cloud. Doors and openings throughout the theater and stage towers would have to be strictly managed to avoid any stack ventilation. This challenge became an opportunity. 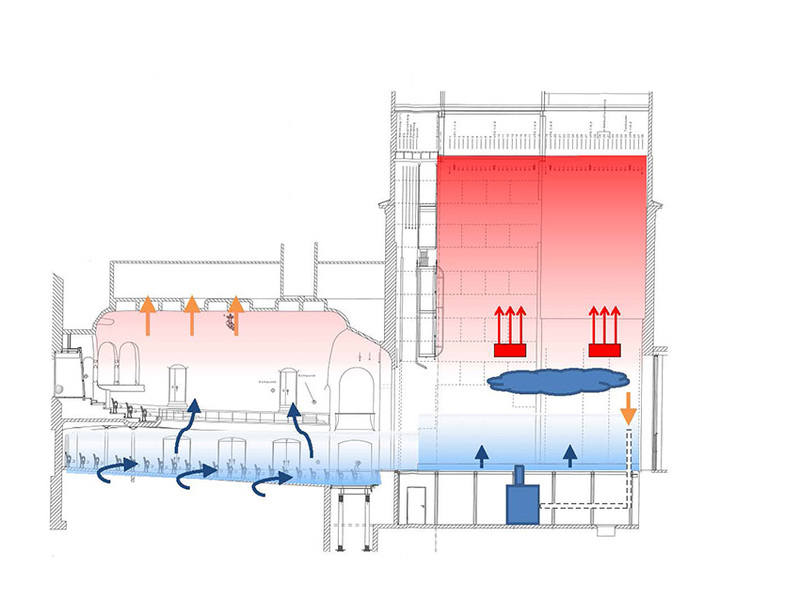 Since the natural ventilation effects were so strong, we decided to use them as a controlled mechanism to remove the cloud “on demand”—lifting it out of sight at the end of the cloud scene. Once we opened the top and bottom doors in the stage tower, it took about 10 seconds for the cloud to disappear. In the end, we used an air curtain system for heating, and installed it upside down above the cloud. We used four machines, centered around the cloud, and packed them into silencer boxes. With remote control heating, power and flow could be managed by the cloud operator. This looked good and allowed us to reproduce clouds consistently. We managed to create a well-controlled stratification. The concept was ready to be integrated into the final stage design. Even with everything in place there was still some mysterious air movement pushing the cloud around. 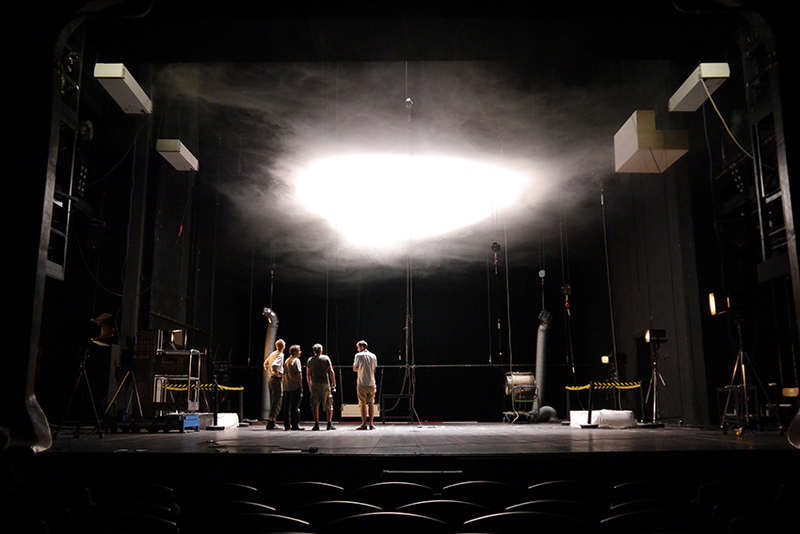 Playing with the controls of the air curtain systems, we eventually found a way to hold the wafting cloud centered over the stage and at the intended height for about 1 hour. The making of the cloud was a process of negotiation between artists and engineers. We took a simple idea with an uncertain starting point, and we turned it into a well-integrated component of the stage design. It was an exercise in connecting, and reconciling, ideas and criteria from two distinct sides. We constantly struggled around a set of critical questions: Does it work well for the play? Does it look good? Is it technically feasible? Is there a light-tech and elegant way to create the cloud? Making this cloud, we learned to respect once more the viewpoints of the artist and appreciate her message even if we needed to challenge gravity. 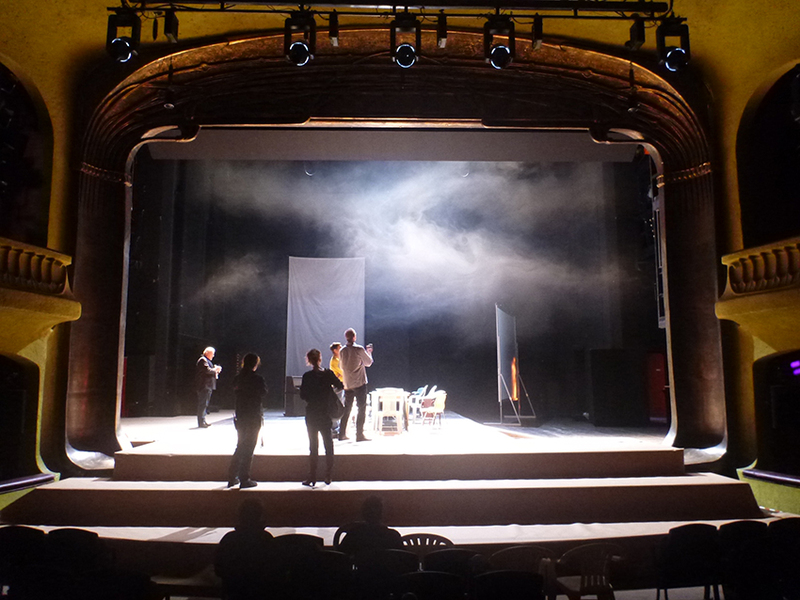 Acknowledgments: The success of this project was only made possible by the professional collaboration and commitment of the artistic and technical crew of the Münchener Kammerspiele. Wolfgang Kessling is physicist and climate engineer based in Munich, Germany. He is principal of Transsolar and frequently lecturing on sustainable design. Wolfgang’s research and development work focuses on zero energy buildings and design for outdoor comfort in urban settings. In 2012 he was invited to give a TED talk on outdoor comfort at the opening ceremony of the first TEDx Summit in Doha, Qatar. Christian Oberdorf is working as Climate Engineer and expert for integral design of innovative buildings at Transsolar Munich. He has been involved in award winning sustainable projects throughout the world including the cooled conservatories of Gardens by the Bay in Singapore, Frank O. Gerhy’s Headquarter for Novartis in Basle and the Visitor´s Center Klimahaus® 8° Ost in Bremen. Transsolar is an award winning company focusing on high comfort – low energy projects all over the world. Transsolar climate engineers are specialized in integral planning in a close dialog with architects with a strong background in physics, building science and environmental engineering. Transsolar is based in Stuttgart, Germany with offices in Munich, New York City and Paris.